Discuss legal issues that are of a general nature - Which jurisdiction ? AussieLegal - Australia's leading provider of affordable legal kits and paralegal services for probate, administration, binding financial agreements and Australia's largest public legal discussion forum. Posts: 31 Quote Reply Topic: Which jurisdiction ? Maritime Services Act 1935 Section 13(U)2 ? Take a look at Doyles Guide to find a lawyer suitable for your purposes. At that time I did not know that the section of the Act related to obstruction of the waterway. You can see from this picture that there was no such thing. To me it doesn't look like the waterway is being obstructed, I guess it doesn't to you either, however that is irrelevant, to prove that there is no obstruction you will need to present at court an expert witness who can state that there is no obstruction and in the process prove that the expert witness that the other side will produce has got it wrong. Always remembering that the maritime authority may well be the only body to determine if the waterway is obstructed or not. You really do need to talk with a lawyer who has expertise in this matter. 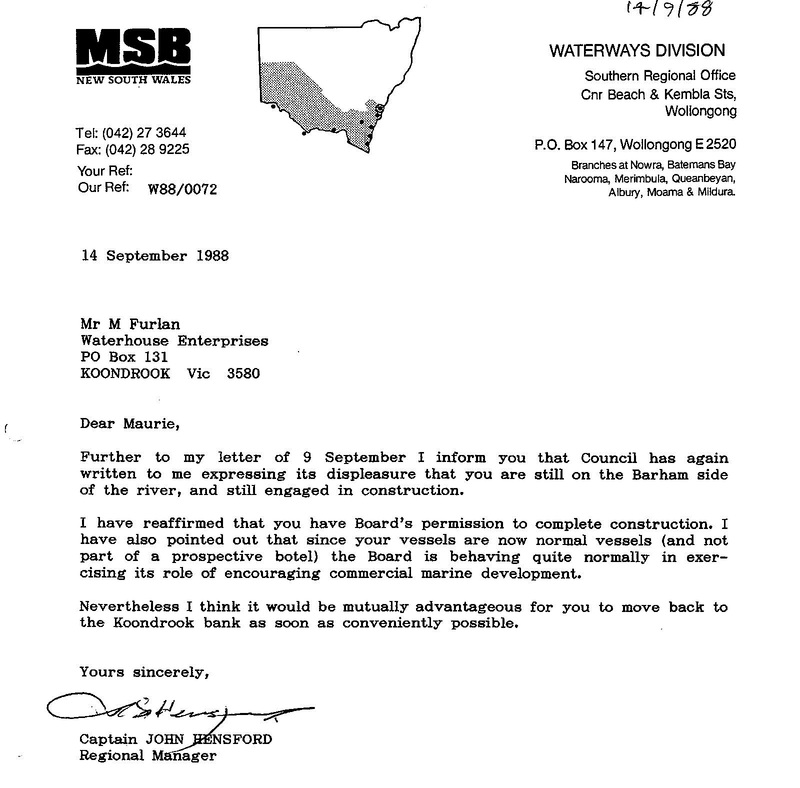 However I note that the notice you have presented is dated over 25 years ago. I would suggest that you are way out of time to act in this matter. Thanks again citizen-joe. It turns out that I was qualified as Ships Master Class 5 at the time and furthermore the vessels were located on the Victorian bank of the river when they were seized. They were located alongside the MV Barkoona floating Jetty shown at right in this picture and in the care of Capt. Ray Dowell. Despite the Statute of Limitations; Maritime are now conducting a preliminary investigation into the matter and I will most likely engage a lawyer soon. The fact that you had marine qualifications will be in your favor, however you cannot be your own expert witness, if you can ever get this to court. See that solicitor before you proceed any further. 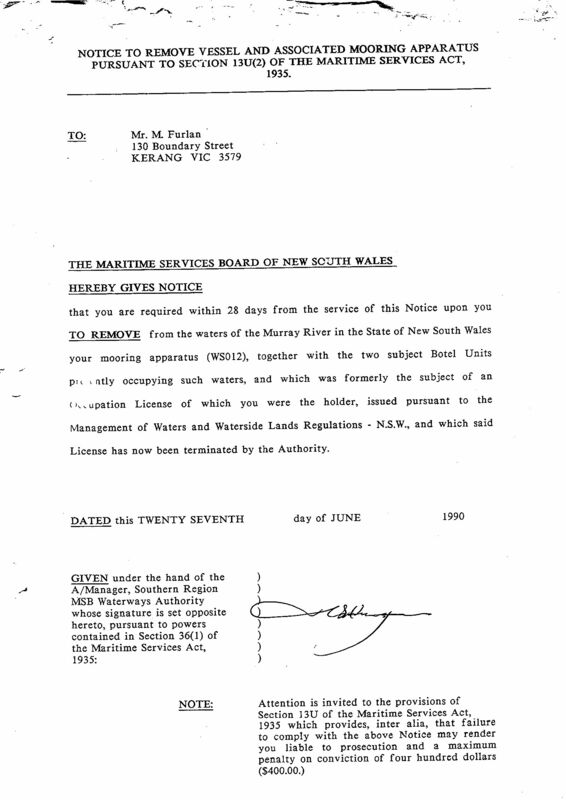 Here are 2 documents both signed by Captain John Hensford Regional Manager NSW Maritime Services Board. 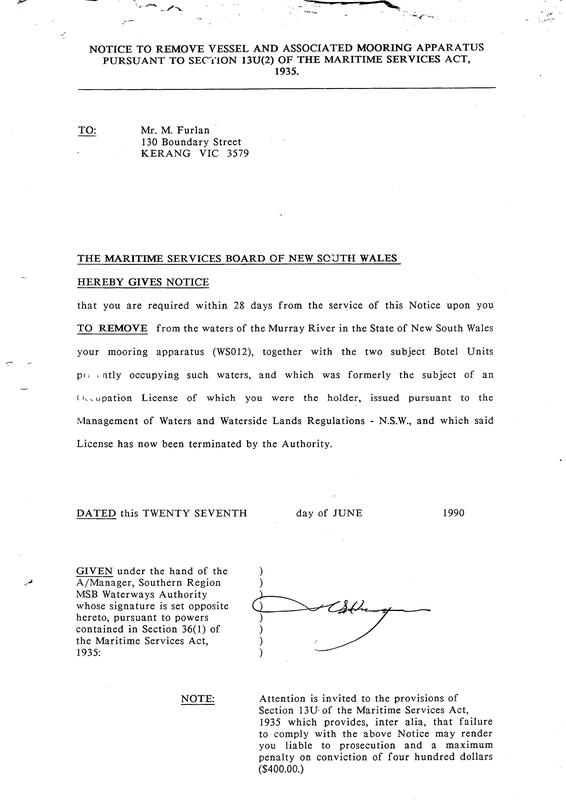 The first reaffirms written approval for construction of 'normal vessels' as "commercial marine development"
The second documents by Captain John Hensford is official Notice describing cancellation of mooring licence and subsequent seizure of vessels. Sorry I'm not from that part of Australia, check that guide, but as previously advised you may be trying far too long after those events to achieve any redress. Any local solicitor could advise you about that aspect of your enquiry and probably point you to an appropriate firm. If you are advise that you have a case, get a quote before you proceed, remember if you lose you may also be up for the other sides costs. This could be an expensive exercise. This matter has progressed. Following a GIPA (aka FOI) application, I now know that the Maritime NOTICE (shown earlier post) is not recorded in any Register. It is an INVALID DOCUMENT "legally and officially unacceptable". Government officials confiscated my property (2 houseboats) as a result of it. I have now located my property near Murray Downs NSW. I want to regain possession of it and have charges laid. Will you kindly advise how I am to proceed please ? Thanks citizen-joe. I have been told that the matter is probably time barred under civil law. If it is a criminal matter then no time limit. My property was illegally confiscated. I am wanting IPC to determine the NOTICE is INVALID. When they do this then how do I report it and recover my property. Thanks. Sorry I don't know, all I see is a legal minefield, and large expenses. One other consideration, in what state are the houseboats? They've been out of your control for years, rot, rust, termites, marine worms, etc. Is there anything worth pursuing? 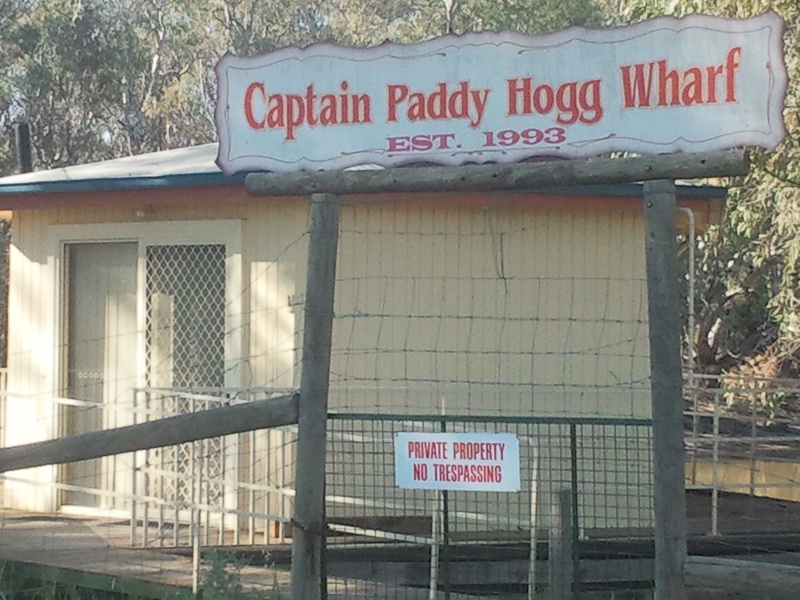 My remaining vessel is now known as Paddy Hoggs Wharf located on the NSW riverbank as described below. I consider this to be a criminal matter in which I have been deceived and defrauded. Can you please advise further. Hope someone can advise you, sorry I've no idea. I have learned that my vessels were confiscated under Maritime Services Act 1935 Sec 13U(2). I note that section has been repealed. How can I discover when this happened?